A handcrafted necklace full of beautiful details in it's design. This one of a kind piece features soft feathers, colorful turquoise beads, and hammered sterling silver hoops. 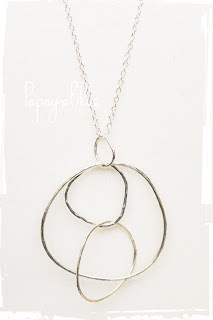 Part of the classic collection, this one of a kind, handcrafted, necklace simply displays a beautiful mingling of three oblong sterling silver hoops. Add this to any outfit to add some style. Go check out Papaya Blue Designs at the Portobello West May 26 & 27, 11am-5pm! For over five years, Portobello West has sought out and presented some of the best in emerging and established local talent. Featuring over 50 local designers at a time, each of our four seasonal Markets brings you a curated selection of handmade accessories, fashion, jewelry, and art. This beautifully crafted, sterling silver, cuff is hand stamped with words of wisdom from the beloved star of Hollywood's Golden Era, Judy Garland. The quote on the cuff reads "Always be a first rate version of yourself, instead of a second rate version of somebody else." Cuff is 3/4" wide and adjustable to fit just about any size wrist. 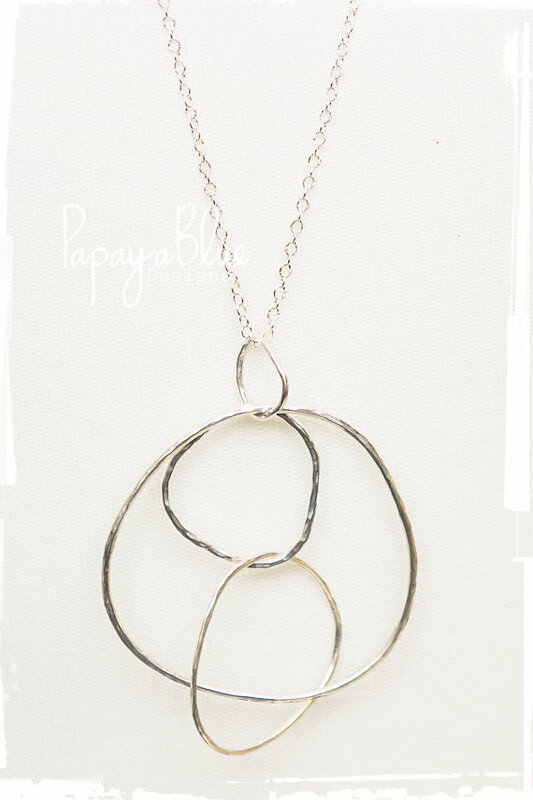 Here's one of our favorite necklaces! The emerald stones are perfect for a night out, or even just for a normal day out on the town. The magenta and emerald green silk ribbon is hand-dyed and can be replaced with other ribbons for a dramatic or simple look. The hammered oxidized silver half moon adds a little edge to it! This necklace can be worn with a simple t-shirt, jeans, and stilettos to make it the focal point of your outfit. People will definitely notice you and your limited edition and one of kind necklace! Meet Marni Fernandes our amazing artist, and here's her story! 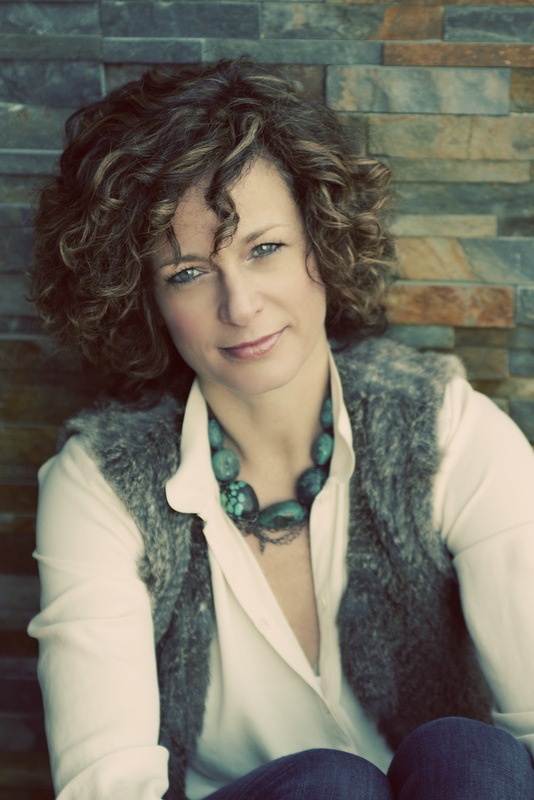 "As I think about my story I begin by traveling back to when I was a 7 year old playing in my moms jewelry box, layering necklace upon necklace until I could not stand straight. It is this fond memory and many others that has me thinking about the elusive question, "what inspired you to start papaya blue?" My “aha” moment has been a slow crescendo of growing up and gaining self awareness. And if it wasn't for my travels, experiences, relationships and curiosity I would not have been able to create my pieces with the depth and personal meaning as I do now. When I begin to create a piece I like to explore the idea that a simple design along with unique individual pieces can create the greatest impact. Each hoop, link, band has its own distinct shape, texture and feel and when put together to make a bracelet, necklace or ring they fit together creating a piece that is as unique as the person wearing it." Sometimes it is in the simplicity of a design that can create the greatest impact. 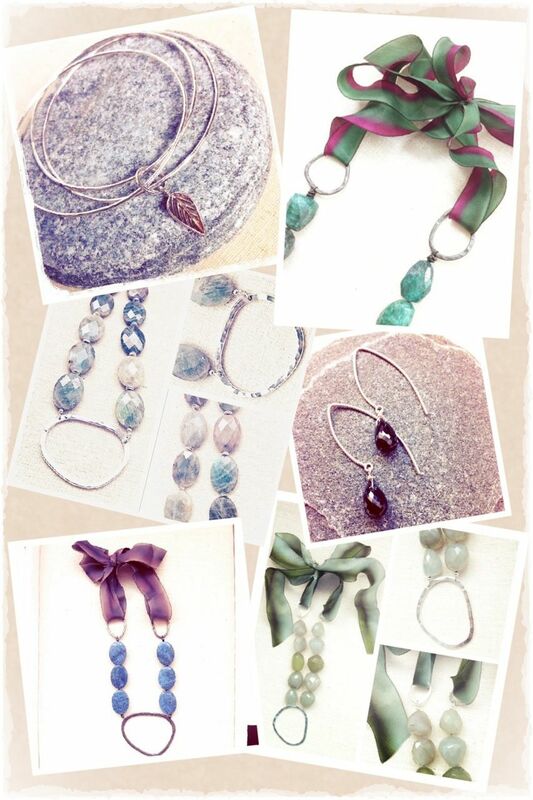 Every piece is handcrafted in sterling silver using soft shapes and semi-precious stones. Check us out on Etsy and Facebook!